While the Sunni Islamist group Boko Haram makes headlines in Nigeria, a Shia group is also causing anxiety in some quarters, the BBC's Mark Lobel reports from the city of Kaduna. Saharan sand swirls around us as horses gallop through the film set we are visiting. Brightly painted walls and wooden and straw weaponry line old forts, recreated to mirror the scene of the brazen Islamic revolution that arrived here in the 19th Century. I am seeing for myself how media-savvy the mainly-Shia Islamic Movement in Nigeria has become. Inside the compound, a dubbing operation is under way. Flattering documentaries of religious leaders are being translated into the local Hausa language, with hundreds of DVDs sold to eager locals every month. The movement has had a thriving daily newspaper for more than two decades and says it will soon broadcast its internet-based Hausa radio station on the country's main air waves, and start up a new TV channel. In recent years, the once tiny movement's membership has sky-rocketed in size and scope while all attention has shifted to Boko Haram, the Sunni Islamist group fighting for an Islamic state in Nigeria. Some are worried that this movement may be growing unchecked by the current ruling powers it condemns as discredited. Its leader, Sheikh Ibraheem Zakzaky, became a proponent of Shia Islam around the time of the Iranian revolution in 1979. 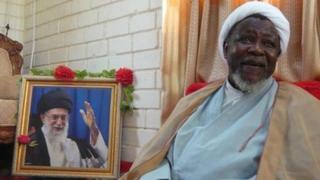 Events in Iran encouraged him to believe that an Islamic revival was also possible in Nigeria. Ever since, he has grown increasingly confident he can build a permanent Islamic state within the country. Although he denies his movement gets any funding from Iran, he is also vehemently anti-American. When I met the white-bearded, traditionally dressed religious leader, who looked older than his 57 years, he resembled a peaceful, friendly, elder statesman and smiled as he told me that he now has hundreds of thousands of followers. We sat together on his bright, fluffy pink, red and white rug and an orange-flowered garland framed a hanging portrait of the revolutionary Islamic leader of Iran, Ayatollah Khomeini, who watched over us. But followers here, including Sheikh Zakzaky, are closely watching present-day events in Iran. The US and Israel threaten to attack the country if fears of a nuclear weapons building programme there are realised, despite Iran's insistence its nuclear ambitions are purely civilian. I asked the sheikh if Iran were attacked, would it have an impact in Nigeria? "Not only in Nigeria, in the entire world," he said. Sheikh Zakzaky did not explain what would happen, but added: "How much the impact would be, would depend on which areas were attacked." Throughout our encounter, the vagueness of some of Sheikh Zakzaky's answers - perhaps driven by his apparent mistrust of the media, he separately recorded our conversation in order not to be misquoted - not only leaves many of his statements open to interpretation but also creates the perception he may have something to hide. Sheikh Zakzaky was a political prisoner for nine years during the 1980s and 1990s, accused by successive military regimes of civil disobedience. His supporters have been involved in many violent clashes with the state over the decades - 120 of his followers are currently in prison - and political analyst Muhammad Kabir Isa says they do constitute a genuine threat. Mr Isa, a senior researcher at Ahmadu Bello University, describes the sheikh's movement as "a state within a state". "I know for one that his outfit embarks on drills, military drills," Mr Isa said. "But when you embark on military drills, you are drilling with some sort of anticipation. Some form of expectations." Sheikh Zakzaky later told me his movement did train hundreds of guards to police events, but compared it to teaching karate to the boy scouts. Mr Isa also alleged the movement's supporters have now become a lot more influential in society. "I know for example he is making sure his members are recruited into the army, his members are recruited in the police force, he has people working for him in the state security service," he said. Kaduna state spokesman Saidu Adamu said he could not confirm if the movement's followers were in the police, army or state security services but said he hoped it would not affect their loyalty to the state if they were. The state's relationship with the movement may also determine how peaceful it remains, according to prominent human rights activist Shehu Sani. He campaigned for Sheikh Zakzaky's release while the cleric was a political prisoner and says the government has to take its share of the blame for the recent violence by Boko Haram, which says it is trying to avenge the 2009 death in police custody of its leader, Mohammed Yusuf. "If the Nigerian state applied the same measure of cruelty and extrajudicial killings to the members of the Islamic movement as it did to Boko Haram, we would be faced with a violence that's a million times more than that because the Islamic movement's well organised and educated," according to Mr Sani. The Nigerian government says it is prepared to talk to Boko Haram though it describes it as a faceless organisation with unrealistic demands. In Sheikh Zakzaky's home town of Kaduna, Boko Haram has directed attacks at both the security forces and locals. When I met Kaduna's Governor, Patrick Ibrahim Yakowa, to discuss the current security crisis, he told me he wanted to make use of all religious leaders to find a solution urgently. I asked the governor if he had reached out to Sheikh Zakzaky. "We are trying to reach out to everybody and I am sure, sooner than later, I will get across to him," he said, underlining a conciliatory approach that has so far not borne results. In contrast, it looks unlikely that Sheikh Zakzaky would be prepared to engage with the governor. During our interview, he did say he would consider entering the political process and could, for example, have his own political party, if the system worked. But he said the current system did not work. He rather surprisingly blamed that system for causing the current insecurity in the country by insisting Boko Haram was a creation of the "oil-hungry West", whom he accused of using the Nigerian security forces to carry out heinous crimes here. "Security forces are behind it," he said animatedly. "There's nothing like Boko Haram. I have never seen a single man calling himself Boko Haram. Our enemies are from outside. And they are the ones behind those bombings." That theory goes against much of the evidence about the group that does exist, as the government has arrested senior members of the militant outfit and police stations and army barracks are often the targets of attacks. Oil analysts insist that the last thing the West would want is instability in the country, which, they say, would in fact jeopardise their operations here. Yet Sheikh Zakzaky's followers, young and old, confidently told me they agreed with his view of who was behind the unrest and were in full support of the sheikh's brand of Islam spreading across the whole of Africa, not just Nigeria. As I watched thousands gather for a weekly Koran class led by Sheikh Zakzaky, women covered in black clothes seated on one side, men in lighter clothes on another, they all appeared peaceful and studious. The movement does not seem to be an imminent threat to either the government or Nigerian people. But with a greater allegiance to external powers, and a clear hatred of parts of the West closely tied to the current government, the situation remains precarious.